The Weimar Republic’s heyday provides a grit and glitz-soaked backdrop for Philip Kerr’s brilliantly plotted and superbly researched final novel. 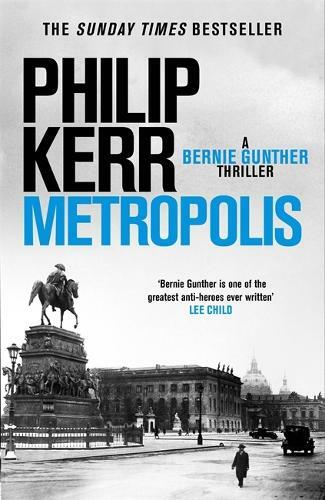 Set in 1928, Metropolis returns to a younger – but no less cynical - Bernie Gunther, still bearing the fresh scars of his experiences during the First World War and busily climbing the ranks of Berlin’s murder squad. Fans of the series will relish the pleasure of watching Gunther navigate the maze of a younger city, well-aware of the dark future awaiting him in the wings. Bernie Gunther is a young detective working in Vice when he gets a summons from Bernard Weiss, Chief of Berlin's Criminal Police. He invites Bernie to join KIA - Criminal Inspection A - the supervisory body for all homicide investigation in Kripo. Bernie's first task is to investigate the Silesian Station killings - four prostitutes murdered in as many weeks. All of them have been hit over the head with a hammer and then scalped with a sharp knife. Set in Germany’s Weimar Republic this is chronologically the earliest of the Bernie Gunther thrillers. Published in 2019 it is the last to be written by Philip Kerr before his untimely death last year.